Il faut dire, Madame is very loud today. Because you chewed through another phone charger cord dammit. Why this makes Madame irritable is a curious thing. Of COURSE I’m irritable. You chewed right through it. Who DOES that? Does Madame ask a rhetorical question? Puppies chew things. You’re not a puppy. You are not even a kitten. You are an adult cat. Il faut dire Madame she states the obvious. 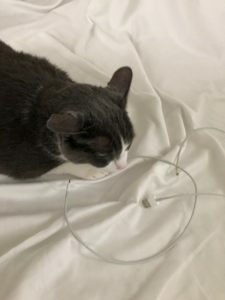 My point is, chewing a charger cord is not an adult cat activity. And it’s very annoying. Why do you have to chew everything you come across? Le cord suddenly appears in the mouth. C’est completely mystérieux. So the teeth, they find they must thoughtfully chew on it. This petit cat is always serious. By the way, there is also my bedroom curtain. You clawed a hole in it! Who does THAT? Ahhh, le bedroom curtain. The finch was in the bush outside and it was necessary to reach out to it. The curtain she jumped in the way. C’était un petit snag. Madame is making too much noise about it. A small snag? It’s two inches across! Your teeth and claws do a lot of damage. There’s also there’s my poor Peace Lily. You chewed on the tips of the leaves and made them raggedy. It looks terrible! Not to mention it is toxic. Actually eat that stuff and I’ll have to rush you to the vet. God knows what they will do to you there. Biting the lily leaf was un experiment très unpleasant. The taste, it is ghaack. Not the nice little snack, the amuse-bouche, that had been anticipated. Madame needn’t worry about this petit cat becoming poisoned. There is no need to make threats of the vet to add to the general unpleasantness. That petit experiment will not repeat. We have friends we visit a couple of times a year, and they have a cat that will literally eat socks. So we have to secure our socks in our suitcase at night . . .
omg, I’ve heard of dogs that do that, but never cats!